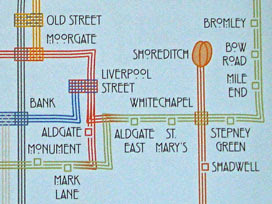 It's widely acknowledged that the London Underground tube map is a classic. Maybe not the current version, but the general idea of simplifying a rail diagram to render it more easily understood. For this we must thank draughtsman Harry Beck, whose 1933 redesign brought order and elegance to London's twisted layout. But do his rules work quite so well today with a more complicated network, and are they applicable to other systems in other cities? An academic exhibition, curated by Dr Maxwell Roberts, aims to find out. 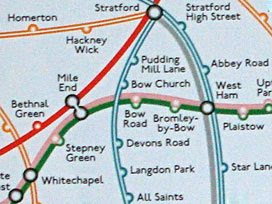 To reach Max's exhibition you'll need to head for a station that appears on Beck's original tube map but isn't on the network any more. That's Southend Central - formerly a seasonal outpost of the District line, and rather further out of town than any exhibition about the tube would normally venture. It's a bit of a trek but, on arrival at Southend station, your destination is only a few metres to the north inside big shiny South Essex College. You'll need to collect a visitor's pass from the front desk (which sort of makes you an honorary student for a brief time) and then it's up to the first floor to have a look at some maps. There are a lot of maps. Big computer-generated maps, some of them based on real diagrams, others best described as topological flights of fancy. You may need to have the order of display explained to you, because it's not immediately obvious where to start, but the first is a pre-Beck map designed by F H Stingemore. See those cartographically-accurate wobbles? Those are what Harry removed, and his map is positioned alongside for contrast. If you're the sort of person who could spend a minute comparing nuances between the two diagrams, then this exhibition is for you. Next up along the balcony, an experiment. Max is a psychologist by trade, and reckons that maps are really an intelligence test set by their designers. He experimented by presenting people with three different versions of the London Underground map - the present one, a simplified version and a design nightmare - and invited his subjects to try to plan a series of journeys on each. Unsurprisingly the simplified version - one of Max's own - performed best. And that's before you take into account all the daggers, blobs and additional symbols on TfL's current map - all of it information pollution - which would widen the usability gap even further. Next up, what happens if you change the rules? Beck initially insisted on a 45° angle for all his diagonal lines, but there are examples here of what happens if that angle is changed to 15° (ooh, very wide) or 75° (ugh, that's severe). He also insisted on octolinearity (essentially that's a square grid plus diagonals only), whereas it's perfectly possible to draw maps that are tetralinear, hexalinear or even dodecalinear (no, my spellcheck doesn't recognise those terms either). These make for intriguing alternative tube maps, but none quite so unnerving as the design which rotates London through 90° and sticks Upminster at the top. It'd never be acceptable to the general public, obviously, but I thought that this was the very clearest version of them all. Off the balcony and through the double doors are some wilder flights of fancy. An Art Nouveau whimsy with curling branches and buds (illustrated above), and a Charles Rennie Mackintosh number that's all elegant and griddy (illustrated above). Max has clearly had a lot of fun knocking up all of these maps, and has been utterly painstaking in their execution. A brief series of foreign metro maps follow, both the official version and a Roberts retweak. In Paris and Madrid, Max argues, carefully sculpted curves could make the network far easier to comprehend. In 1970s Moscow, however, a single circle crossed by intersecting straight lines might have been the most optimal tube map ever. 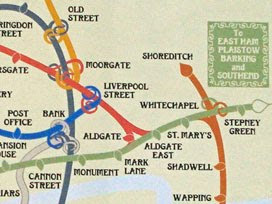 And finally, of course, Max's legendary curvy tube map. Are its gentle arcs the solution to TfL's 21st century design problems? Or does removing all of the kinks take a familiar map too far? No conclusion is drawn - as with all these maps you're left very much to make up your own mind. But with an extended DLR and Overground about to debut on the official diagram, and later Crossrail to jam forcibly across the centre, maybe the time has come to bend some of Beck's original rules for the greater good. This isn't the largest exhibition you'll ever see - it's laid out along an architecturally inept balcony and around a couple of ante-rooms. And it's only open for another week, so you'll have to hurry if you want to get there. But if good design, or the psychology behind it, interests you, then a trip to Southend is in order. Go next Saturday and you should meet Max himself, with the added bonus that (unlike last Saturday) there are no rail replacement buses to endure along the way. You might choose to buy a colour copy of some of the maps, four of which are available for you to take home and treasure. Fold and laminate the curvy version and you could even carry it around London in preference to TfL's latest design. Not suggesting, just saying.